The title of this writing may seem to be rather unusual. After all, we would suppose the church to be a safe place  right? However, unfortunately, the church has sometimes been a place where many have experienced wounds instead of healing. 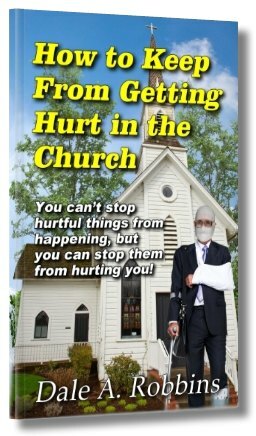 In fact, statistics show that a great percentage of persons who cease attending church, do so because of some type of offense or injury to their feelings that happened there. Sometimes these occur because of the insensitivity of the church; other times, people are themselves at fault for being too touchy or sensitive to misunderstandings. In any case, it is sad that such experiences ever occur, because the church is an indispensable part of the believer's life. Not only does it provide a place to worship, serve and learn about God, but it is also a community where believers can practice love toward their brethren as the Bible requires; "But if we walk in the light as He is in the light, we have fellowship with one another, and the blood of Jesus Christ His Son cleanses us from all sin" (1 John 1:7). Whatever you do, don't give up on the church. God requires you to be faithful to it and to be accountable to its spiritual leaders. (See Hebrews 10:25; 13:17). If you have been hurt there, don't run away  but equip yourself with the protection of God's Word. You may not be able to stop offensive things from happening, but by applying God's principles you can stop them from hurting you. "Great peace have they which love thy law: and nothing shall offend them" (Psa 119:165 KJV). (1) Avoid developing unreasonable expectations of the church  My soul, wait silently for God alone, For my expectation is from Him (Psa. 62:5). The definition of disappointment is the failure to attain ones expectations. Dont expect things from the church or the minister that they cant deliver, or that the Bible doesnt teach for them to do. Many expectations have to do with preconceived traditions which we have come to associate with a church, perhaps from another fellowship we once attended or grew up in, etc. Its a good idea to meet with the pastor and ask what you can expect of his ministry and the church. Occasionally people get disappointed when they find out their church cant supply all their earthly needs. Most ministers and churches do attempt to help people in every way they can  especially the needy during crisis and emergencies. But some people come to expect the church to meet all their material needs or pay their bills like the early church did. Unfortunately, this just isnt possible unless everyone agrees to sell all their property and possessions and give them to the church like the early believers (Acts 4:34-35). Most churches would be blessed if everyone merely paid their tithes, however statistics show that only a small percentage of churchgoers give a full tithe regularly. Neither is it realistic to expect the pastor to spend all his time with you, to attend every social function, or for him to show you constant attention. Instead, learn to place your expectations upon God  He will always be faithful to His promises in His Word and will never let you down. (2) Dont place an absolute trust in people  Thus says the LORD: Cursed is the man who trusts in man and makes flesh his strength, whose heart departs from the LORD (Jer. 17:5). Come to terms with the fact that everyone is human and will fail you at sometime or another. Even the pastor will make mistakes. The only one you can trust entirely without fail is God. Realizing that any human can fall short, the degree of trust we place in people must be limited and will depend on their track record. The more we get to know a persons character and the history of their behavior, well be able to determine how trustworthy they are. This is one of the reasons why the scriptures tell us to get to know our pastors and spiritual leaders  so from their godly lifestyle, well be able to trust their leadership. And we urge you, brethren, to recognize those who labor among you, and are over you in the Lord and admonish you. (1 Thes. 5:12). Theres a difference between love and trust. Its possible to love and forgive someone, without placing an absolute trust in them. To illustrate this, lets say theres a school bus driver who has a drinking problem. One day while transporting a load of children he becomes intoxicated, wrecks the bus and kills all the children. As the lone survivor of the crash, he turns to the church to seek Gods forgiveness for this horrible act of irresponsibility. If he repents of his sin, will God forgive him? Absolutely. Should the church love and forgive this person? Of course. And what if he would then like to volunteer to drive the church bus for us? Do we trust him? Absolutely not! It would be unthinkable to put a person in the drivers seat who has shown such recent negligence. Certainly, we love and forgive him, but because of this mans poor track record, we could not risk the lives of our passengers. Over a long period of sobriety and safe driving, this person may be able to prove that he is again reliable or trustworthy. Remember that love and forgiveness is granted unconditionally, but trust must be earned. Trust is the acquired confidence in a persons actions. We certainly can, and should trust persons who show trustworthy behavior, but because all men have the potential for failure, we should never put an infallible sense of trust in anyone but God. (3) Focus on common ground  Now I plead with you, brethren, by the name of our Lord Jesus Christ, that you all speak the same thing, and that there be no divisions among you, but that you be perfectly joined together in the same mind and in the same judgment (1 Cor. 1:10). Avoid becoming highly opinionated. Opinions are the interpretations and ideas of men, which if constantly pressed on other people, can cause division or promote sinful debates and quarrels (Rom. 1:29). Opinionated people are prone to get hurt when others disagree with them. The Bible teaches for all Christians to speak the same thing so that there will be unity in the body of Christ (1 Cor. 1:10). The only way such unity is possible, is for Christians to focus on the common ground of Christ and His Word. That is, we need to say what the Word says, to let the Word speak for itself and not try to promote divisive opinions about it. In scripture, we see that Paul instructed Timothy to Preach the Word, not his opinions (2 Tim. 4:2). A preacher is intended be a delivery boy of Gods message, not a commentator of the message. Thats the Holy Spirits job (1 John 2:27). Similarly, at one time the news media was required to comply with a very strict code of ethics. They were to report the facts of the news accurately without adding their opinion or commentary. However, as time has passed, news reporting has become less factual and more opinionated  corrupted with rumors and gossip rather than real information. Reporters have evolved into commentators which manipulate what people think about the news. Like reporters, preachers need to stick with the facts. Naturally every believer has his or her own convictions about a great many things, but if you continually try to push your opinions on others, conflict will eventually emerge. Avoid controversy over scriptures which are vague and foster many interpretations  stand fast upon those common, basic truths  Jesus, His life, death and resurrection  and dont add to what Gods Word says. Every word of God is pure; He is a shield to those who put their trust in Him. Do not add to His words, lest He reprove you, and you be found a liar (Prov. 30:5-6). It is remarkable to consider that the Apostle Paul  the great author of scripture  openly confessed that he was not perfect. Like us, he experienced struggles in his flesh to do the right things. If one of the leading authors of scripture and apostles of the early church admitted to this, it should not seem too strange if we find other brothers and sisters in the church struggling with imperfections too. Since churches are made up of people like you and me who have imperfections, there will never be such a thing as a perfect church. Unless people understand this, theyll have an unrealistic view of the church, and will eventually become disillusioned and hurt. One of the jobs of the church ministry is to help perfect the saints  like a spiritual hospital, where people go to get well. Instead of resenting persons in the church for their flaws, be thankful theyre there trying to grow in Christ to get better. Learn to love and accept people for what they are  theyre not any more perfect than you are. Just as it has been said of beauty, imperfection is in the eye of the beholder. A person with a negative attitude can find fault wherever they wish. In contrast the person with a positive outlook can always find the good and beauty in things. The well adjusted person in the church should seek out the good and encouraging things as the Bible teaches (Phil. 4:8). Those who dwell on the negative or continually find fault with the church will eventually get hurt. (5) Dont seek to promote yourself or your own agenda  Do not lift up your horn on high; Do not speak with a stiff neck. For exaltation comes neither from the east Nor from the west nor from the south. But God is the Judge: He puts down one, And exalts another (Psa. 75:5-7). Have a humble and meek attitude like Christ (Matt. 11:29, Rom. 12:3). Besides being obnoxious, pride and arrogance will set you up for a fall (Prov. 16:18). Dont promote yourself, campaign or strive to attain an appointed or elected position. God is the one who puts persons in such positions, and unless He does it, stay away from it. Lift up the Lord in all that you say and all you do. Dont boast or talk about yourself. He who speaks from himself seeks his own glory; but He who seeks the glory of the One who sent Him is true, and no unrighteousness is in Him (John 7:18). Avoid an attitude of competition which creates conflict in unity. A competitive attitude compares self with others, and strives to rise above that comparison (2 Cor. 10:12). The philosophy of Christianity is not to try to outdo one another, but to submit to and lift up one another (Eph. 5:21). We are even told to prefer our brother above ourselves. Be kindly affectionate to one another with brotherly love, in honor giving preference to one another (Rom. 12:10). Competition between churches and Christians is divisive and contrary to the faith. Dont expect to receive preferential treatment or to get your way about everything. The Bible teaches that favoritism is wrong, and the church will try to make decisions and do things in the best interest of the whole congregation, not just a certain few. ...but if you show partiality, you commit sin, and are convicted by the law as transgressors (James 2:9). If you do things for the church or give generous offerings, do it to bring glory to God, not to bring attention to yourself or to gain influence (Col. 3:17). The Bible even says that when you give charitable offerings, do it anonymously so to gain Gods approval, not merely mans (Matt. 6:1). Avoid the trap of presuming that your opinions are always divinely inspired or are indisputable. Share your suggestions and ideas with church leaders, but dont press your opinions or personal agenda. Sometimes, persons feel that all their ideas come from God. They may attempt to add clout to their suggestions or complaints by saying God told me so. Indeed, God does speak to His children, but you will not be the exclusive source through which God reveals himself in a matter. If your opinions really come from God, the Bible says that others will bear witness with it, especially His pastors and leaders (2 Cor. 13:1, 1 Cor. 14:29). (You wont even have to invoke Gods name  theyll be able to tell if your ideas came from Him. Be cautious, lest you find yourself using His name falsely, a very dangerous thing  Ex. 20:7). Pastors are His representatives in His ordained chain of command, and if He wants to get something across to His church, Hell bear witness with the persons in charge. (6) Avoid blaming the church for personal problems  You will keep him in perfect peace, whose mind is stayed on You, because he trusts in You (Isaiah 26:3). When you go to church, you should try to dissociate the church from the other personal problems you deal with. The majority of hurt feelings in a church result from wounds and sensitivities people carry in with them. This kind of emotional distress can create distorted perceptions which may prevent you from seeing reality the same way others do. Such things as a low self esteem, abuse as a child, marital problems, personal offenses, family conflict, a root of bitterness, health problems or job dissatisfaction can twist your interpretation of words and actions. You may imagine that people dont like you (paranoia), or misinterpret well-intended words as an offense. Trivial problems will seem like big problems. Blame for unhappiness may be transferred to the church, its leaders or the people. You may lash out against others or be quick to find fault with the church. Remember this: Dont jump to conclusions over anything, because things are usually not as bad as they seem. (7) Treat others as you wish to be treated  Therefore, whatever you want men to do to you, do also to them, for this is the Law and the Prophets (Matt. 7:12). Human beings tend to be reciprocal creatures. That is, they reflect the way they are treated. This is why Jesus gave us the Golden rule: Do unto others as you would have them to do unto you. The way that most people interact with you is as a direct result of how you interact with them. If you have a frown on your face, you wont get many smiles. If you offer friendliness, it will usually be offered back (Proverbs 18:24). Be gracious, encouraging, and a blessing for others to be around. If you have a negative, critical attitude toward people it will tend to generate their critical attitude toward you. Judge not, and you shall not be judged. Condemn not, and you shall not be condemned. Forgive, and you will be forgiven (Luke 6:37). Many hurt feelings can be avoided if we will realize that people usually react to how we deal with them. Take a close examination at the way you say things, or even how much you talk. ...a fools voice is known by his many words (Ec. 5:3). Dont be rude and impolite. Check your attitude that youre not overbearing and bossy  people will be turned off and will seek to avoid you. (8) Have a teachable, cooperative attitude  Obey those who rule over you, and be submissive, for they watch out for your souls, as those who must give account. Let them do so with joy and not with grief, for that would be unprofitable for you (Heb. 13:17). A lack of proper respect toward authority is a common problem today. People dont want to be told what to do, or be corrected if they are wrong. This is one reason why the modern church is turning out so many immature believers. When some people hear something they dont like, or are corrected in some way, they simply pack up and go to another church down the street, or church-hop until they find one that says things they like to hear. For the time will come when they will not endure sound doctrine, but according to their own desires, because they have itching ears, they will heap up for themselves teachers (2 Timothy 4:3). As long as you are a part of any particular church, you must come to accept that the pastor and leaders are in charge there. Regardless of how unqualified you might think they are, God recognizes them as the authority in that body and will hold them accountable to that responsibility. Consequently, God holds you accountable to respect their authority, to pray for them, and to cooperate  not to be defiant and rebellious. Always be cooperative, willing to humble yourself. If you have a rigid, inflexible attitude in the church you will probably get hurt. (9) Dont oppose or hinder the church  These six things the LORD hates, yes, seven are an abomination to Him: A proud look, a lying tongue, hands that shed innocent blood, a heart that devises wicked plans, feet that are swift in running to evil, a false witness who speaks lies, and one who sows discord among brethren (Prov. 6:16-19). One of the things that God dislikes most are those who sow discord  who create division and strife in the body of Christ. Dont be a gossip, a complainer, or stir up turmoil. If youre displeased with the church in some way, offer your help to make improvements, pray for it, or as a last resort, find another church youre happier with  but never become a source of agitation or hindrance. Dont badmouth a man of God  if you do so, youre asking for problems. One time when Paul was punished for preaching the Gospel, he unknowingly condemned Ananias, the high priest, who had ordered the apostle slapped. However, when Paul realized who he was, he apologized for speaking against Ananias, knowing that its forbidden to speak against Gods representative  despite the fact that Ananias treatment of Paul was in error (Acts 23:5). It is a serious matter to touch Gods anointed  either with our words or our actions. Imperfect as they may sometimes be, they are His representatives. He permitted no one to do them wrong; Yes, He reproved kings for their sakes, Saying, Do not touch My anointed ones, And do My prophets no harm (Psa. 105:14-15). If a minister has done you wrong in some way, dont incriminate yourself by responding in an unbiblical manner  dont lash out against him, retaliate with rumors against him, or run him down behind his back. You should go and confront him privately according to the scriptural fashion described in Matthew 18:15-17. If the first and second attempts do not bring a resolution, take the matter to the spiritual body, such as the church board, or denominational overseers to whom he is accountable  any correction or discipline should be left to them. Keep in mind, an accusation against a minister is a serious matter and will not be accepted unless the matter can be substantiated by other witnesses (1 Tim. 5:19). When things are not as they should be in the church or with its leadership, there are honorable ways to help promote improvements or resolve inequities. However, its unethical to oppose the church or attack its leadership, and persons who do will likely end up hurt, bitter or possibly worse. (10) Be committed to forthrightness and truth  Moreover if your brother sins against you, go and tell him his fault between you and him alone. If he hears you, you have gained your brother. But if he will not hear you, take with you one or two more, that by the mouth of two or three witnesses every word may be established. And if he refuses to hear them, tell it to the church. But if he refuses even to hear the church, let him be to you like a heathen and a tax collector (Matt. 18:15-17). When someone has wronged you, Jesus says that you are to first go to them and confront them privately between yourselves. Most offenses in the church result from misunderstandings, and many could be quickly resolved if offended parties would just go to the source and find out the facts. Unfortunately, some offended people will just absorb the offense silently, while growing bitter and resentful. It is important to God, and a matter of obedience to His Word, that such issues are confronted so that (1) you will not become bitter and withdraw from the church, (2) that the offender is held accountable to not repeat his offenses which could harm the faith of others, and (3) so that the offender who has perpetrated sin might be reconciled with God. If they are uncooperative with your first private effort, you are to try a second time, taking witnesses with you. Finally, if no success, turn it over to church leadership. You should never take one side of a story and accept it as fact without verifying it with the other party. There are always two sides to a story. The scriptures address this very problem, that before we believe a rumor, we are to investigate thoroughly, to verify all the facts. ...then you shall inquire, search out, and ask diligently... if it is indeed true and certain that such an abomination was committed among you... (Deut. 13:14). Without doubt, it is not possible to have a relationship with a group of people without occasional misunderstandings and offenses. And unless you will commit yourself to confront these issues in the way Jesus described, you will become hurt in the church. (11) Be devoted to love and forgiveness  He who loves his brother abides in the light, and there is no cause for stumbling in him (1 John 2:10). Christians will avoid a lot of problems if they will just commit themselves to an unconditional love for their brethren. The practice of loving the brethren  all the brethren, not just the lovable ones  keeps us from stumbling. Never forget that Jesus takes personally how we entreat our Christian brothers and sisters. When we love even the least of our brethren, Jesus accepts that love toward Himself (Matt. 25:40). You cannot love the Lord any more than you love the least in the body of Christ. If someone says, I love God, and hates his brother, he is a liar; for he who does not love his brother whom he has seen, how can he love God whom he has not seen? (1 John 4:20). Be quick to forgive and dont hold grudges. Unforgiveness and bitterness is one of the greatest reasons why people get hurt in the church and probably the greatest cause of apostasy  falling away. Remember that unforgiveness is one of your greatest enemies. If you refuse to forgive, it will prevent Gods forgiveness of your sins and could keep you out of Heaven. For if you forgive men their trespasses, your heavenly Father will also forgive you. But if you do not forgive men their trespasses, neither will your Father forgive your trespasses (Matt. 6:14-15). (12) Dont get caught up in the offenses of others  Lord, who may abide in Your tabernacle? Who may dwell in Your holy hill? He who walks uprightly, And works righteousness, And speaks the truth in his heart; He who does not backbite with his tongue, Nor does evil to his neighbor, Nor does he take up a reproach against his friend (Psa. 15:1-3). One of the great characteristics of the body of Christ is to care about the burdens and sufferings of one another. However, as we seek to console and encourage friends that have been offended, we may be tempted to take up their offense against another. In sympathy, we may tend to take their part against the pastor, the church or whoever they blame for the offense. This is very unwise and an unscriptural thing to do, considering that your friend may be the cause of his own offense. His hurt feelings may be due to a misunderstanding, a difference of opinion, his own rebellious attitude, emotional instability  or he may be childish and immature. There are always two sides to a story, and only an idiot develops an opinion based on one side or without all the facts. Sometimes offended persons will seek sympathy from naive, listening ears. They go about pleading their case, pouring out their bleeding-heart of injustice to those sincere, tenderhearted persons who will listen. Their goal is to seek out persons who will coddle them, support their opinion and take up their offense against the offending party. You should love and encourage a friend with hurt feelings, but reserve your opinion and avoid taking sides, lest you find yourself a partaker in other mens sins, or you also become offended and hurt with the church. (13) Dont personalize everything thats preached  Obviously, every pastor preaches with the hope that everyone will take the message personally and apply it to his or her own life. If the shoe fits, wear it. However, there are always a few who think the minister is pointing his sermon specifically at them. This is a common misunderstanding which causes persons to get hurt. Feelings of personal focus from a sermon may occur if persons are (1) under conviction about a particular matter, (2) especially self-conscious, (3) under emotional distress, (4) if they spend a lot of time counseling with the pastor, or (5) if he has previously corrected them or hurt their feelings in some way. Keep in mind, a pulpit preacher doesnt focus his attention solely upon one person. His concern is for the broad range of people in attendance. Occasionally persons think their pastor focuses on them, the same way they focus on him. When a pastor stands in front of a congregation week after week, they develop a feeling of close friendship with him  they come to know personal details of his life, his family, and other traits. However, even if the pastor knows each person in his flock, its not really possible for him to concentrate on each with the same detail that they do on him. Its easy for dozens of people to know him well, but not realistic for him to know dozens of people in the same way. Consequently, some develop the illusion that the pastor focuses on them when he preaches  that he remembers their personal details in the same way they remember his. But the pastor has too many other people to consider. He counsels with dozens of people, hears scores of similar problems and details. Its not likely he will single someone out and preach at them, while trying to minister to the whole congregation. If theres something specific that the pastor needs to say only to you, he will deliver it to you personally, in private  not in subtle hints from his sermon. Besides this, it is the job of the Holy Spirit to personalize Gods Word to us so that well examine ourselves and search our own hearts. When the Lord is dealing with us about His Word, it may seem like the pastor is speaking directly to us. Sometimes the Holy Spirit may even direct the preacher to unwittingly say things that may pertain specifically to us. The best attitude to have is to listen to each message objectively. In every sermon from the Bible, God has something to say to all of us. Be open to whatever the Lord would have to say, willing to accept His correction or guidance. Defensiveness is usually a sign of resistance to conviction. It is my prayer that these principles will help and encourage you in your relationship with the church. If you been injured there or have merely strayed away, I urge you to find God's grace to forgive those who may have hurt you and return to the fellowship of God people. As challenging as it may seem sometimes, the church is Christ's plan for His people, and it is there that He will develop and mature you into a fully equipped disciple of His kingdom. This article (VL-167) is copyrighted © by Dr. Dale A. Robbins, 1990-2019 and is a publication of Victorious Publications, Grass Valley, CA - Nashville, TN. Unless otherwise stated, all scripture references were taken from The New King James Bible, © Thomas Nelson Inc., 1982. You may download this article for personal use as long as you retain credit to the author. Obtain permission before reproducing copies for any reason, by filling out our simple use permission form. Many of our writings are also available as free pdf tri-fold pamphlets, which can be downloaded for reproduction from our Online Catalog. For media reproduction rights, or to obtain quantities of this title in other formats, email us. If you have appreciated these online materials, help us reach the world with the Gospel by considering a monthly or one-time tax-deductable donation.